Students put worm costumes on (sleeping bags) and crawl across the floor like worms in a relay race. The first players from each team crawl to their partners on the opposite side of the room. When they reach them, they take off the sleeping bag and put it on the next player from their team. That player then worms their way back to the starting line to finish the race. 1. Sleeping Bags. That’s it. This one is easy. Make sure there’s no rusty knives or land minds on the floor. We played with 2 teams of two players each, but really there is no limit to the amount of teams you have go at once – the more teams the more fun. Have teammates stand across from each other at opposite ends of your racing area. When the game starts the first worm puts on their costume and races across the floor towards their teammate. When they reach their teammate the first worm takes off the sleeping bag and the second player puts it on and races back towards the starting line. First team to finish the race first wins! Watch out for legs hanging out the back making it easier to move, make sure the worms’ hands and feet stay on the floor, and remember to keep the racing area narrow so you can see more worm on worm action. We played this Sunday & it was awesome! Instead of having them trade off at each end we made them turn around & come back to trade off. It was hilarious & everyone was really into it. We pitted girls vs. guys. Next time I’d like to play this with about 5 people across & include our leaders. That’s awesome Josh! You’re right, the more worms the better, it’s so funny watching them crawl around haha. This game is legit. 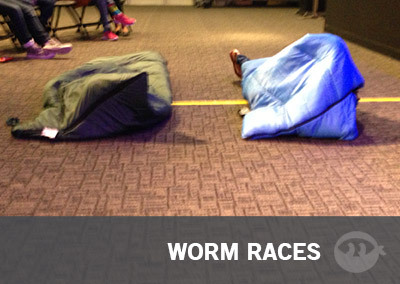 I had two or three sleeping bags leftover from our DNow event, so it was sort of like Middle School Pastor payback and crazy worm races all in one!